Movies to Celebrate Chinese New Year 2012! Celebrate the 2012 Chinese New Year – the Year of the Dragon – the lighthearted FILMCLUB way, with our new Season of the Week. 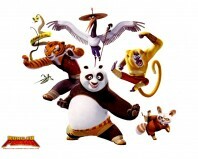 Check out our selection of great feature films for kids, with, you guessed it, a Chinese theme! Get some light relief with the recent box office hit Kung Fu Panda, which follows the crazy exploits of comedian Jack Black as a high-kicking hero – and lovable Panda – in this funny animated tale. Fans of sci-fi will love the fantastic Chinese language film CJ7, about a little boy whose new best friend happens to be from space. And for serious kung fu fanatics, there are not one, two but three martial arts marvels – Crouching Tiger Hidden Dragon, Iron Monkey and The Forbidden Kingdom. Between them they have some of the most spectacularly choreographed moves in cinema history. For those wishing to watch a film with a more gentle pace, dip into rural Chinese culture with Not One Less, a beautiful tale about a 13-year-old girl, who is depended on by her small community to find a school boy after he goes missing. Pick a film from our Season of the Week and celebrate the Chinese New Year the movie-lovers way!